Guarded High Resistance Hamon Transfer Standards | Ohm-Labs, Inc. Guarded high resistance transfer standards allow accurate 100:1 build-up of high resistance. Each device contains ten nominally equal resistors permanently connected in series. A commutator cable assembly allows connection of the ten resistors in parallel, giving 1/100th the series resistance. Other ratios are easily made. BPO connectors provide high repeatability and guarding. BNC or type N connectors are also available. The internal guard network is made with resistors nominally equal to the main resistor values, for uniform guard voltage gradients in any configuration and ratio. Each high resistance transfer standard includes a commutator cable assembly which can be connected to some or all the resistors, allowing intermediate ratios to be realized. An internal thermistor allows monitoring of temperature during use. All models are supplied with ISO17025 accreidet calibration. 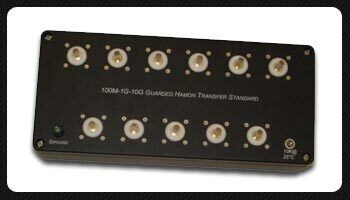 Low resistance Hamon transfer standards, based on the Leeds & Northrup design, are also available. For the highest commercially available accuracy in high resistance, please see our unique temperature stabilized Multiple High Resistance Standard, model MHS, or Ohm-Labs 100-H series Guarded High Resistance Standards..
All resistance standards carry a five year warrantee.